Still need to get Dad a gift for Father's Day? Last year I read Hemingway on Fishing and enjoyed it, even though I'd already read most of the excerpts in their originally-published form. 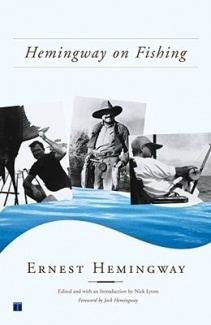 A nice collection of some of Ernest Hemingway's fishing-related writing, including what must be my favourite short story of all time - Big Two-Hearted River. 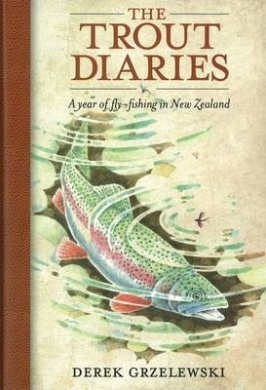 Another enjoyable read, with a New Zealand flavour, is Derek Grzelewski's The Trout Diaries. 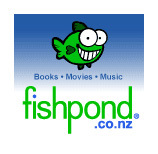 Kennedy Warne (founding editor of New Zealand Geographic, amongst other things), states on the back of the book that it will "satisfy angler, adventurer and philosopher alike." - I couldn't agree more! 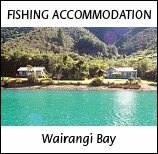 From Hunting and Fishing in Marlborough – A history of the Marlborough Acclimatisation Society and a guide for present day sportsmen; pages 11, 12. Originally published 1980. Scans of the pages are at the bottom of this article. This article shows the text from the original that relates to fishing, with some editing to help with flow. In 1898, trout fishing was described as attracting an increased number of anglers and grey and paradise ducks were increasing in number, but the "evil" of poaching had reached its climax, with out-of—season slaughter and netting of trout. 94,000 brown trout were liberated and good reports of fish stocks were to hand. Rainbow trout had been liberated in the Omaka River and the Society viewed the trout fishing sphere with optimism. Rainbow trout were being increasingly liberated in an effort to match the fine brown trout fishing with rainbow sport. Some 18,000 yearling rainbow trout were liberated in the streams near Blenheim, and one two-and-a-half year old rainbow trout caught in the Opawa was weighed at between 4.5 and 5.5 pounds. 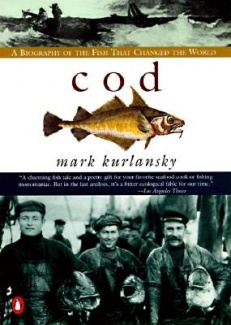 By 1906 the Society appeared to be in good heart but fish and game populations were being attacked by "rife poaching". The Society was determined to stop the poaching and the selling of game and said the wholesale slaughter for selling purposes had to be stopped. Ducks were being exploited by poachers and black market selling. The number of licences issued was; deer, 18; game, 49; trout fishing, 76. 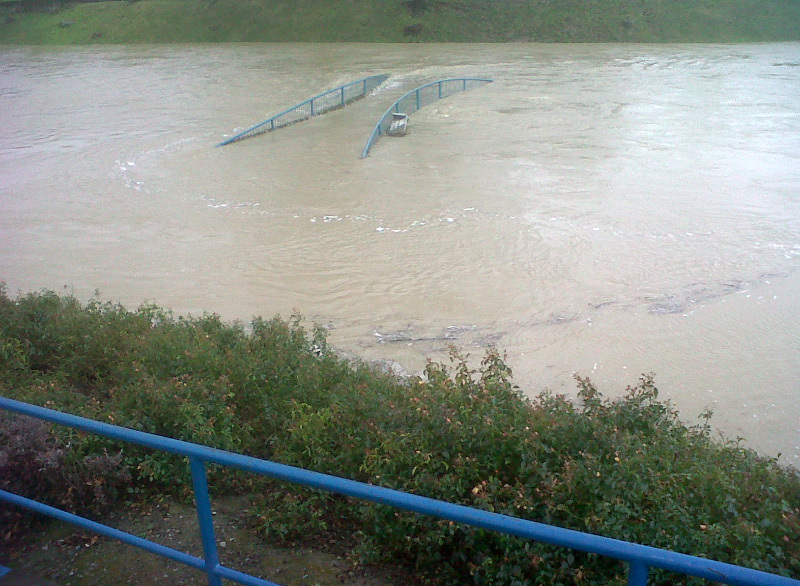 The trout hatchery functioned well and trout, among them "sea-run brown" trout from South Canterbury, were released. Flooding in July, 1909, interfered with the operation of the Springlands trout hatchery and work there temporarily ceased. Game, both native and imported, was said to be on the decrease and a lack of finance made it difficult to import stock for liberation. A closed season for both imported and native game was decided upon for the next season. The Society continued its energetic efforts with the hatchery. A "magnificent gift", Waterlea Park, was made by the Society’s president, Mr W. Pollard, to the Blenheim Borough, and provision for the continuation of the hatchery pleased the Society. Encouragement to the Society was generally poor however, and the Annual Report of 1915 deplored “the lack of interest" by members of the Society. In 1916, the Marlborough Acclimatisation Society received a visit from Mr Ayson, the Government’s Fisheries Director. He praised the operation of the Springlands hatchery and the potential of the Wairau River for salmon. The First World War (1914-18) caused the Marlborough Acclimatisation Society to ponder whether a drop in fishing licence sales was because of the number of “young fellows that have left the district to fight for the Empire". Mr Ayson, Government Fisheries Director, made an exhaustive survey of the Wairau River to assess its suitability for quinnat salmon, with the consequence a hatchery for quinnat salmon was built at Timms Creek, a North Bank tributary of the Wairau. Finances were also restricting the operation of the Springlands hatchery, but the Timms Creek salmon hatchery functioned well with Government assistance. Subsequent reports indicated that the Society made efforts to obtain Atlantic salmon for fishermen, and stubble quail for shotgun sport. The Te Rou salmon hatchery had not paid dividends, and in the 1929 report the Council expressed disappointment that no runs of salmon had eventuated. The 1930 report noted a "small run" of salmon had taken place in the Clarence River and expressed optimism that the runs might extend to the Awatere and Wairau Rivers. Page 11 of Hunting and Fishing in Marlborough – A history of the Marlborough Acclimatisation Society and a guide for present day sportsmen. Page 12 of Hunting and Fishing in Marlborough – A history of the Marlborough Acclimatisation Society and a guide for present day sportsmen. 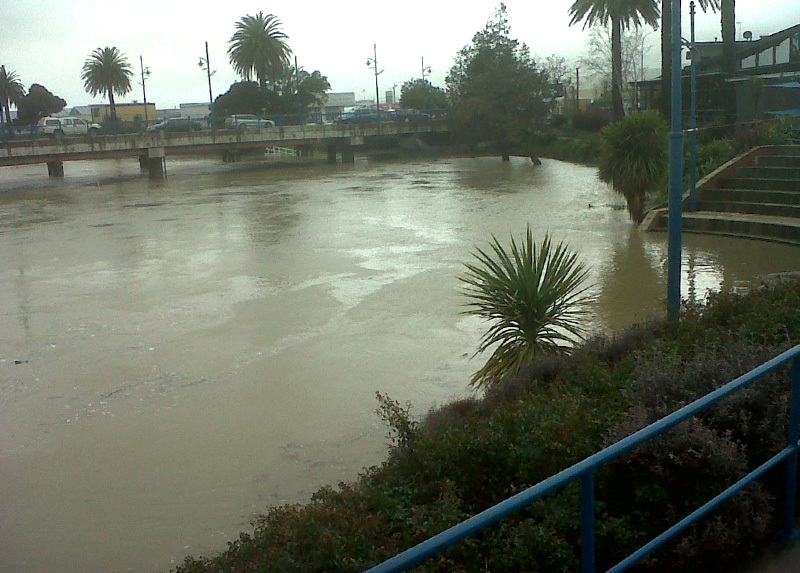 The Marlborough rivers are high and muddy from the rain. A trip into Blenheim yesterday showed the Taylor River almost covering the arched walk-bridge near Raupo Cafe. The walkway that runs beside the river was flooded and unusable. Today the wind was coming from the sou'east, bringing dampness from the sea and cold from the mountains further south. 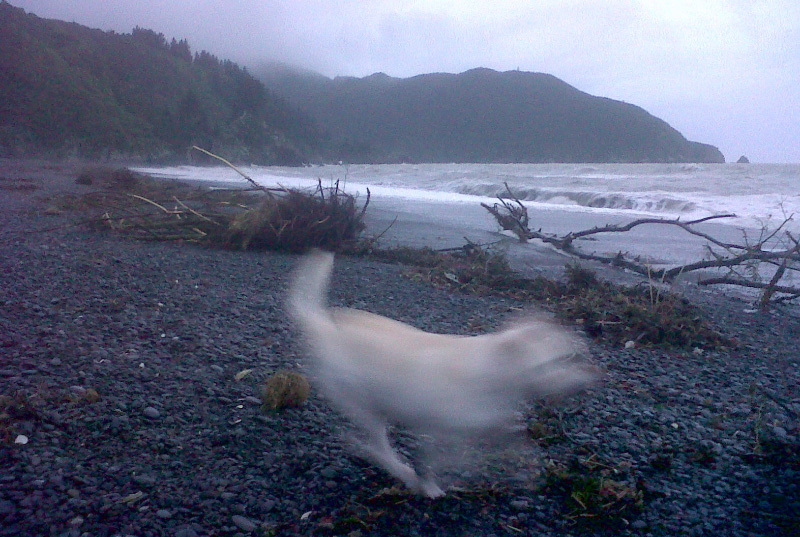 Tee Tee had been curled up shivering by the fire earlier in the day, but was now skipping amongst the newly landed driftwood oblivious to the cold, intent on what she might find. 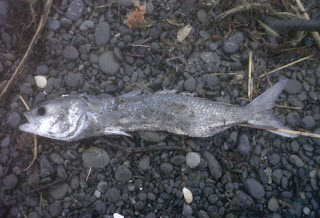 There were some dead fish amongst the driftwood. Trawlers had been working the area a couple of weeks earlier - the dead fish were probably from them. 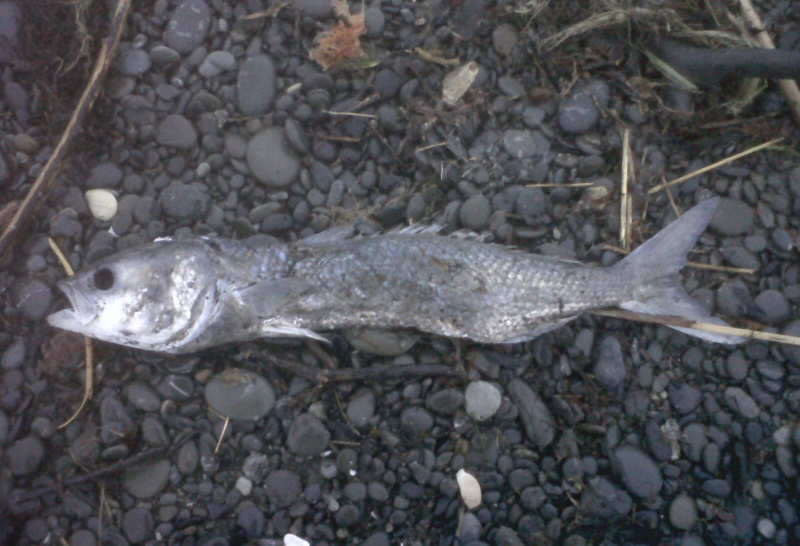 A dead young seal was also seen soon after I noticed the trawlers, but I don't know if they were responsible. 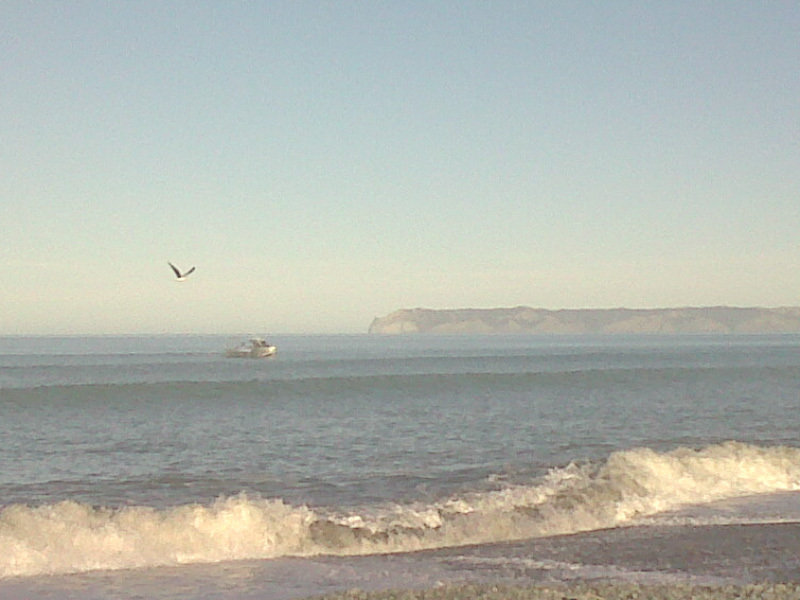 I have a love/hate relationship with the trawlers; I like to see some boat traffic in Cloudy Bay, but I don't like to see them so close to the coast, taking the recreational fishers' catch – especially with the regulations so much in their favour.